Update, 8 Dec 2013 : Keep yourself more informed from these Twitter pages: Women for Schapelle, BobCarr Cover-up & Kim Bax. Update, 17 Aug 2013 : An ABC radio news bulletin reports: "Convicted Australian drug smuggler Schapelle Corby has not received a sentence cut as part of Indonesia's Independence Day celebrations." This was contrary to earlier reports that she had been given hope of an early release. Unless her sentence is reduced, she is not eligible for release until 24 March 2017. 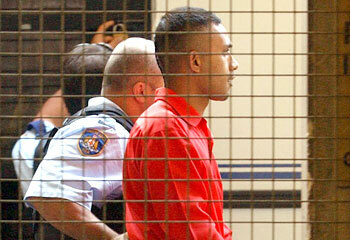 See also: Schapelle to be sent to die in remote Java prison of 5 April 2010, A selective capacity for human compassion? of 24 Feb 2010, Your support for clemency bid needed to save Schapelle's life 12 of Feb 2010, Schapelle Corby's story told on Truth News Radio of 23 Sep 2009. On 27 May 2005, Schapelle Corby was found guilty not by a jury, but by a judge, of attempting to smuggle 4.2kg of cannabis into Indonesia and sentenced to 20 years' jail. However, even a cursory look at the case against Schapelle Corby, for example on Wikipedia, will reveal that the evidence against her is almost non-existent, whilst evidence, pointing to the guilt of the Balinese Police, a coverup and the scapegoating of Corby, is overwhelming. The newsmedia's failure to make this widely understood is yet another of countless examples of its failure in its duty to the Australian public. See also: The political sacrifice of Schapelle Corby of 8 Feb 14 (includes video from Expendable Project story), http://www.freeschapelle.com.au (as of 9 Feb 2014, web-site no longer exists), "Your support for clemency bid needed to save Schapelle's life" of 12 Feb 10, http://www.schapelle.net/, "Kevin Rudd gives Schapelle Corby a raw deal" by Jill Singer in the Herald Sun of 27 Aug 2009, "Schapelle Corby paranoid, clutching doll in Kerobokan jail" by Cindy Wockner and Kormang Suriadi in the Daily Telegraph of 25 May 09, "Premier backs call to bring Schapelle Corby back to Australia" in the Herald Sun of 25 Aug 09, "Schapelle Corby 'clinically insane'" by Adam Gartrell in News Ltd online of 24 Aug 09. In 2002, Senior Constable McEnally, 26, was murdered point blank by Tongan national, Sione Penisini. More foreigners in Australian gaols? Australian laws need to be immediately changed to automatically deport immigrant criminals back to their originating country once found guilty of a serious crime (indictable offence) in Australia. Then judges won't have an option to allow foreign criminals remain here. Conversely, Australian nationals in foreign gaols should be sent home to serve out their time here. Australia ought set up bilateral quid pro quo for prisoners. Our gaols would then only have Australians in them. Schapelle Corby was falsely convicted by the corrupt Indonesian judicial system for the ludicrous crime of having smuggled Marijuhana worth $35,000 in Australia to a country in which it would have been worth $5,000. Having been cynically abandoned by the successive Howard and Rudd Governments, she is now to be transferred away from the life-sustaining support she now receives from her sister Mercedes, a resident of Bali.to a prison in Java. What you can do: Vote for Schapelle to be returned home to Australia in an online Women's Day poll. See also: freeschapelle.com.au and forum, Women for Schapelle on Facebook, A selective capacity for human compassion? of 24 Feb 10. Schapelle Corby's physical and mental health continues to deteriorate to the point where family and close friends expect that she will be coming home in a coffin. Schapelle is almost certainly innocent, as has been shown elsewhere, However Schapelle's supporters are now simply asking that our Government act without delay to prevent tragedy. See also: Latest song for Schapelle Corby on www.artistsforschapelle.com, "Schapelle Corby is innocent, and the Australian Government knows she is" of 6 Sep 09, www.womenforschapelle.com, www.freeschapelle.com.au. Truth News Radio has interviewed Roy a tireless, outspoken campaigner on behalf of Schapelle Corby. Schapelle's physical and mental health is failing in Balinese prison as she serves 20 years for a crime she did not commit. In the Interview, Roy explains the incontrovertible case for Schapelle's innocence of the absurd charge of having smuggled cannabis worth $35,000 in Australia into Bali where it would have been worth only $5,000. Originally published on Truth News Radio. Go there to retrieve broadcast. Interview concerning Schapelle Corby is 25 minutes into the program. See also: Schapelle Corby is innocent, and the Australian Government knows she is of 6 Sep 09.